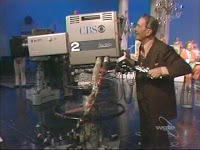 One of my fondest childhood memories is watching the Lawrence Welk Show with my grandparents. My grandmother's world came to a screeching halt every Saturday at 7PM. She sat in 'her chair.' I camped out on my favorite blanket. My grandfather scampered for whatever indulgences Nan and Shawnie required: Bottles of sasparilla or vanilla cream pop, Glen's custard, cheeseballs.... anything his footie pyjama-clad granddaughter demanded, she got. Nan was often at her most accommodating during the show so I could negotiate just about anything with her during commercial breaks, including a later bedtime. I continue the tradition by DVRing Lawrence Welk every Saturday night on WOSU. Partly for its eternally classic music, but mostly because I just love the show in all its wholesome corniess and gut-wrenching nostalgia. Sometimes, I sit with laptop fired up, ready to download tunes that tickle my fancy. Times sure have changed, but in some ways they have not- at least not for an hour on Saturday night. Lawrence Welk's autobiography, "Wunnerful, Wunnerful," was a best seller the year I was born. He seemed to do it all, but what's particularly impressive was that, at his peak of wealth, he was Hollywood's second richest entertainer (not surprisngly, behind Bob Hope) and his variety show was the second most popular tourist attraction in L.A (just behind Disneyland). 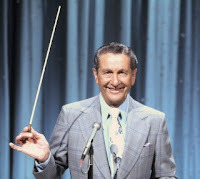 Welk made a killing in showbiz, but it seemed he was as much a serious entrepreneur as he was a musician. He owned the rights to more than 20,000 songs, recording studios and was was heavy into real estate- luxury resorts, country clubs, retirement facilities and also mobile trailer parks. In fact, Welk properties are still around today. I tried my darndest to trade our timeshare for the resort near Palm Springs this May.... it didn't work out, but one of these days we will go. However, I have this sneaking suspicion we'll end up going to see the Lennon Sister(s) perform at the Welk Theatre in Branson, MO first. I hear it's a gas!! Larry's early days were spent on a farm in North Dakota, where his home is now a landmark museum and the ND State University houses the Welk archives. 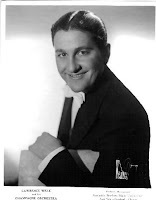 His early bands from the 1920's, '30s and 40's had names that reflected their style: The Biggest Little Band in America, Lawrence Welk's Fruit Gum Orchestra, Novelty Orchestra, and The Hotsy Totsy Boys. (All of these photos come from wikepedia or the archives website). It is safe to argue that Welk spearheaded America's most successful band. But what made them such a hit? Their music targeted middle America. Who doesn't love a good polka? They also introduced America to that vague category then referred to as 'novelty music' - Latin love songs, French dance tunes and other exotic rhythms to which Americans were newly exposed during the world wars. The irony-- as Americana as Welk is, he brought world music into our popular culture. 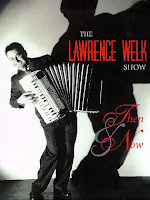 One of the most surprising things I've learned was that a very young Lawrence Welk made his orchestral debut on New Year's Eve 1938 at the William Penn Hotel in Pittsburgh (a place with which I am intimately familiar). This hotel is currently owned by Omni, but remains the city's Grand Dame, serving up one of the best brunches in town, hosting a daily high tea and offering old-school door service by a lanky man in tuxedo and top hat. Time has sort of stood still for this hotel. Fittingly, the William Penn is where the phrase "Champagne Music" was coined to describe Welk's sparkly music and ultimately came to define his style. 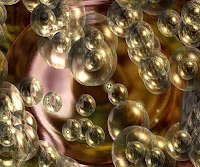 Listening to Welk's orchestra was like sipping the bubbly! Also, it was here the concept of the "champagne lady" took shape. The leading (singing and dancing) lady, so to speak, of which there were eight through the ages. Who knew? I can't tell you how excited I was to learn this Pittsburgh-Welkian connection! Interestingly, Welk's 1940's syndicated radio show was sponsored by none other than the "Champagne of Bottle Beer"- Miller High Life. I'm suddenly inspired to grab a six pack of MHL and make a toast to the Master of Mood music. Adios, au revoir, auf wiedersehen Good Night! Enjoyed reading this piece! I, too, spent pleasant Saturday nights with family while watching this show, reveling in the corniness and the fun music (who doesn't love a good polka indeed?!) -- only I watched with my sisters. We enjoyed the sheer absurdity and good humor of Lawrence Welk et al, despite my mother's protestations that there must be something we'd rather watch instead (she'd watched with her mother too much and developed an aversion to it) - and we still catch it on the local PBS channel sometimes when we're visiting home. Just wanted to say thanks for this reminder of something that never fails to bring a smile to my face - even if occasionally it's one of horror at some of the costumes. I know... the '70s decade is the worst for wardrobe! One Halloween, the entire orchestra dressed in bright orange polyester suits. It was hideous, but the costumes during earlier decades are charming! Matchy-matchy and totally "Doris Day," but charming. 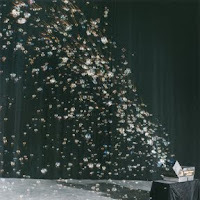 Pink Martini- What's in a name?